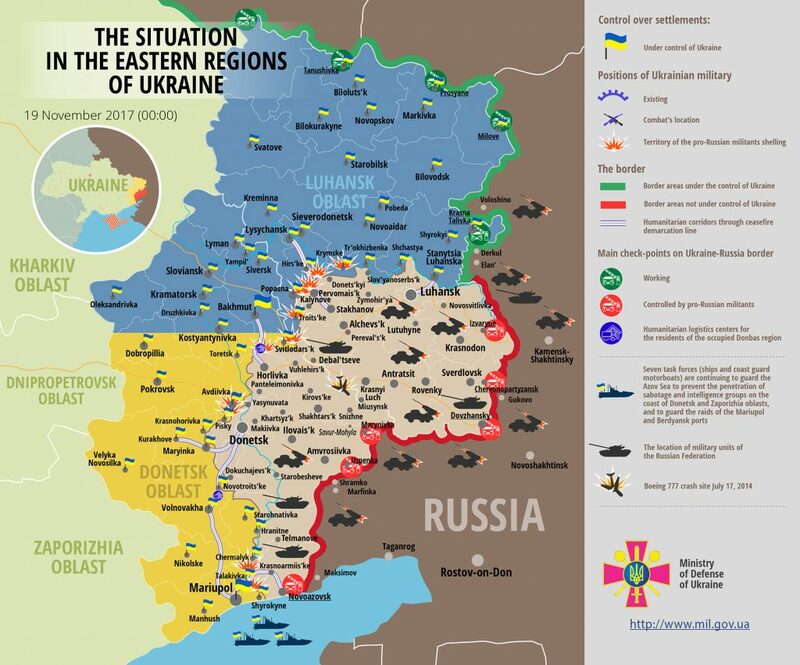 Militants increased their shelling at Ukrainian troops in ATO zone yesterday. They opened fire 30 times, using Minsk-proscribed weapons. Russian proxies opened fire from a tank, 120-mm and 82-mm mortars, infantry fighting vehicle. Ukrainian troops returned fire in 20 cases, using small arms, grenade launchers and infantry fighting vehicle. No Ukrainian serviceman was killed in action yesterday, four were injured, reported Ukrainian Ministry of Defense spokesman on ATO Colonel Oleksandr Motuzyanyk at a press briefing at Ukraine Crisis Media Center. Most militant shelling were carried out in Luhansk sector. “The enemy conducted 18 aimed attacks at Ukrainian positions. They fired from 120-mm and 82-mm mortars, grenade launchers, small arms and infantry fighting vehicle. Russian proxies repeatedly opened fire at Ukrainian troops at Luhanske”, said Oleksandr Motuzyanyk. Militants fired at Ukrainian positions in Troitske from 120-mm mortars. They attacked Novotoshkivske and Novoleksandrivka from 82-mm mortars, small arms and grenade launchers. Zaitseve came under fire from grenade launchers and infantry fighting vehicle. In Donetsk sector, the largest number of enemy’s aimed attacks were registered in the Vodyane area. “The enemy opened fire from 120-mm and 82-mm mortars four times. For more than half an hour, the enemy fired five times at Ukrainian positions from the tank, and carried tight fire from grenade launchers”, said the Ukrainian Ministry of Defense spokesman on ATO. Russian proxies fired from 120-mm and 82-mm mortars at Ukrainian troops in Opytne and Pavlopil. Report on the military developments as of November 18 is available here. Interactive data on the shelling: chronology shelling chart and the interactive map.